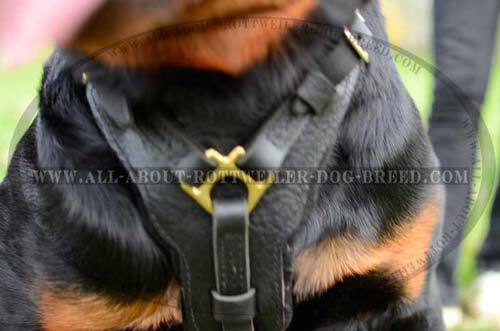 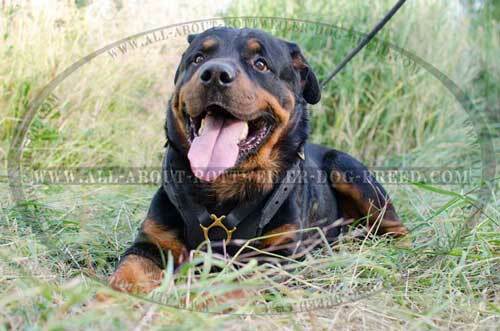 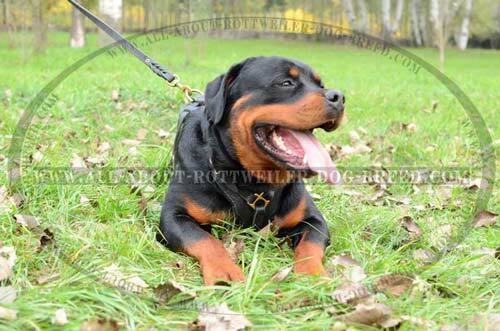 Purchase this great hand crafted Rottweiler harness made of genuine leather! 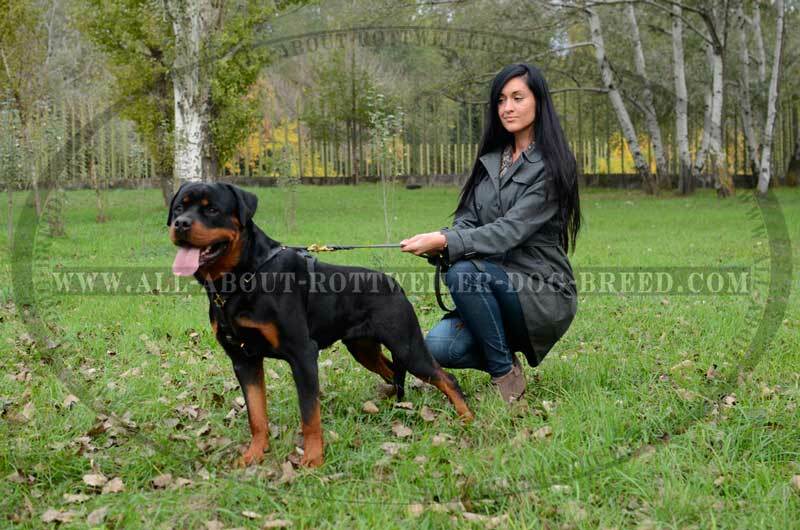 Amaze people around with how classy your Rotty looks wearing this gear. 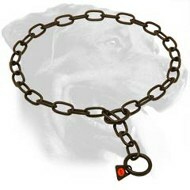 Training isn’t an easy task to do. 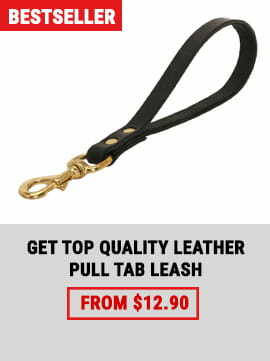 You will need to be consistent, have a lot of patience and of course quality training equipment, like this Super Durable Leather Harness. 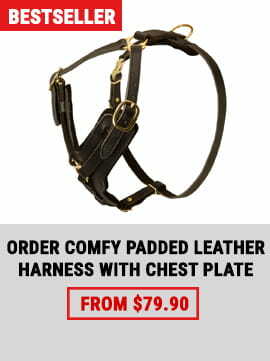 Why it’s better to choose Harness? 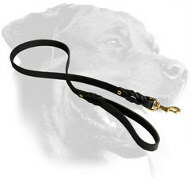 One of the main reasons is that harness distributes the pulling force all over the dog’s body and protects the dog from choking effect. 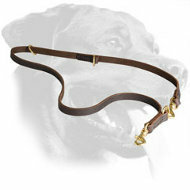 Harnesses are also highly recommended to hyperactive dogs and dogs with neck diseases. 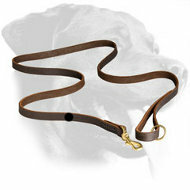 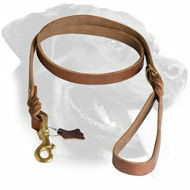 This Leather Harness is specially made to be used during attack, obedience and off-leash training. 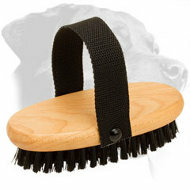 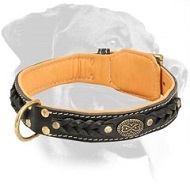 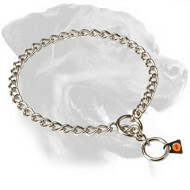 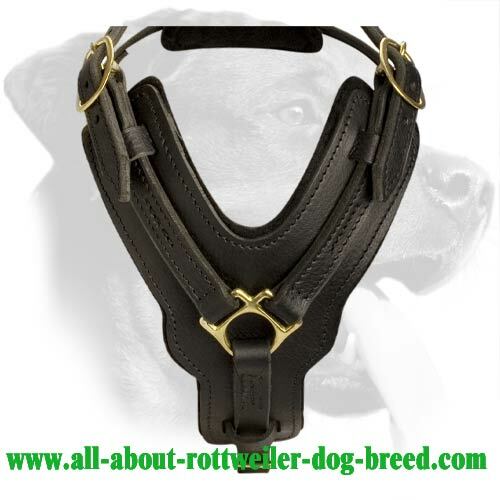 It’s very comfortable and non-restrictive, so your Rottweiler won’t be restrained in his movements. 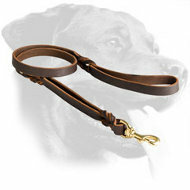 Please note, that you may also order strong handle to be attached to the harness. 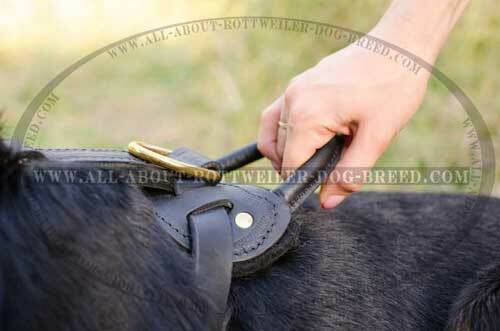 The handle will allow you to have more control over the dog. 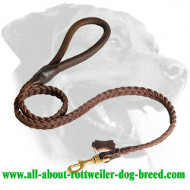 Please, check the information below to find out more about this Leather Dog Harness. 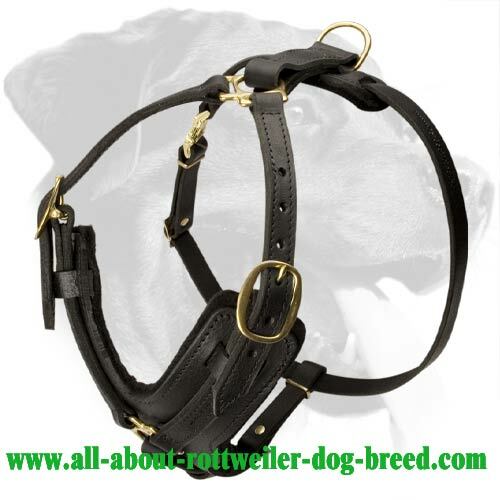 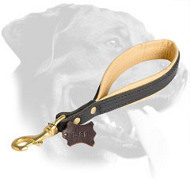 This Leather Rottweiler Harness is perfect for different kinds of training because it’s made of finest leather. 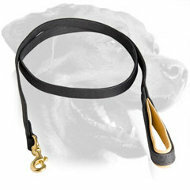 This means that it’s very difficult to stretch the straps of the Harness or tear it. You may be sure your Rotty won’t slip out of this Harness! 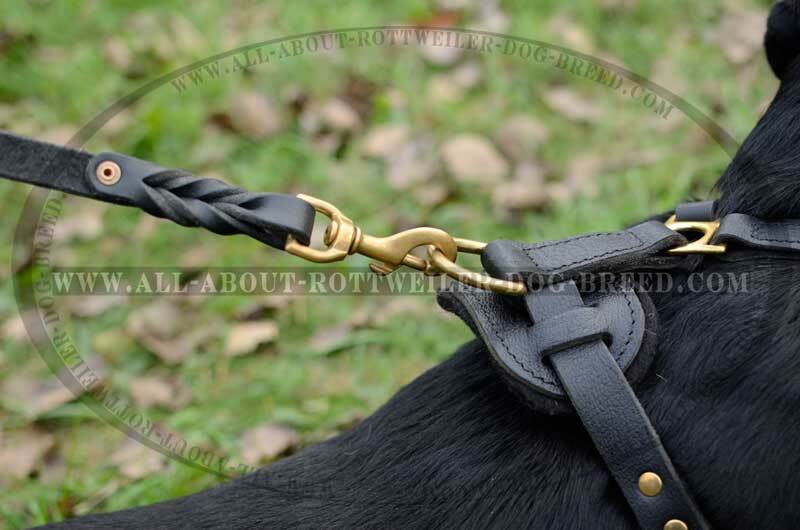 Easy quick release buckle reliably fixes this Harness on your dog’s body and you will have total control over him. 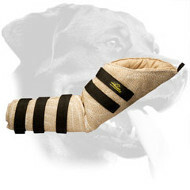 We didn’t forget about your dog’s comfort. Our craftsmen chose the optimal width for the straps and chest plate, so they won’t rub or cut into your dog’s skin. 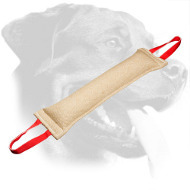 The unpleasant feelings won’t distract your dog during training sessions! 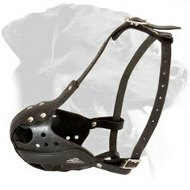 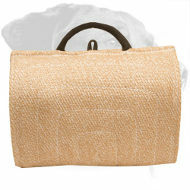 Besides, both chest and back plates are padded with soft material to provide your dog with maximum comfort. The High-quality Leather Harness we present has many advantageous features, so why not buy it and see yourself? 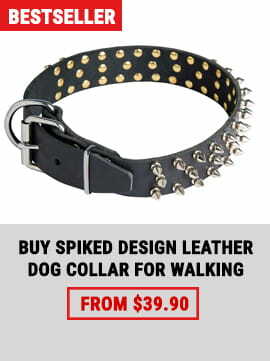 We are sure you won’t be disappointed!